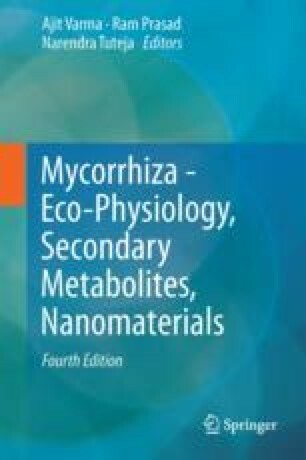 Arbuscular mycorrhizal fungi (AMF) always associate with the roots of higher plants and form a mutualistic symbiosis with the roots of over 90% of plant species, including forest trees, wild grasses, and many crops. Recently, considerable efforts were put to revolutionize agricultural systems through the applications of nanotechnology in various ways. Nanoparticles exploited for plant growth promotion showed the controversial opinions. Similarly, the interaction of various nanoparticles with mycorrhizal fungi found to influence its growth and showed both positive and negative effects. Some of the nanoparticles helps in colonization of AMF, whereas some negatively affects the colonization. Therefore, understanding the exact mechanism of interaction between AMF and nanoparticles is necessary. Hence, in this book chapter, we have focused on the influence of different nanoparticles on the growth of AMF. Moreover, we have also discussed the role of nanoparticle in plant growth promotion. Ajit Varma is thankful to DBT for partial funding and DST for providing confocal microscope. MKR thankfully acknowledges the financial help rendered by UGC, New Delhi, under Special Assistance Programme (DRS-I).